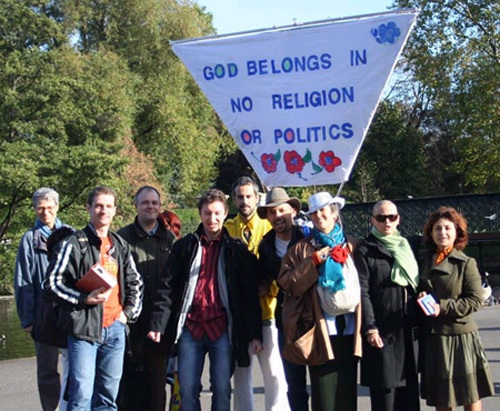 "God has no religion" in Paris turned into "God belongs in no religion or politics" in London. On October 28 and 29 a party of apostles from France strode along Piccadilly Circus, Trafalgar Square and st-James Park. The Londoners sympathized with their views. No, that's not "populism", for which some Emails blame our mission. Being populist is seeking popularity by crying out loud that the world could get rid of all its problems just by getting rid of such and such a person or thing, in this instance religion and politics and their princes, their elite, their laws and institutions. The Ares Pilgrims don't view things from this simplistic angle. They think that "God belongs in no religion or politics", because he belongs elsewhere. He belongs in the heart of a penitent. It's in the man righteous (Rev of Ares XXXVI/19, etc. ), good (30/7, etc.) and free (10/10) that God reappears in the world. So why isn't this painted on the banner? Because penitence, a word that today's people misunderstand or even fail to understand, can no longer meet the eye of the man in the street, who has lost a good sense of his inner tranformation for his own happiness and the world's happiness. This has to be spelled out to him, which needs a talk, even a short one. Hence the banner to trigger it off! Nevertheless, the mission issue "God belongs in no religion or politics" is no flytrap. It is a profound truth. Once the first impressions one has had in skimming through The Revelation of Ares are dispersed, when one buries oneself in the book seriously, one realizes soon that the Father does not distinguish between religion and politics. The Father considers politics as religion's offspring. Either, though it uses a different vocabulary, imposes its doctrine upon men: a dogma here, a constitution and law there, and either punishes the rebels for being sacrilegious. Either makes magnificient promises. Not only are the princes, the priests and doctors religious leaders and their staff, but also presidents, government members and high offices of state and politics. Besides, in The Book the Creator tells them apart only by the color, because they bring the same power to bear over mankind: the white king, the black king, one and the same thigh (XXXVII/14). And in The Revelation of Ares from end to end the Father does not see himself in either. Our apostles bring to England faith just as it has to be considered. Not a man's passive expectation of Mercy and Paradise traded for his faithfulness to his religion, but his active involvement in building a good world. I want to comment on "Truth takes to the street in London"
Delighted to see that the Word has spread to the speakers of English! and labour . . . .